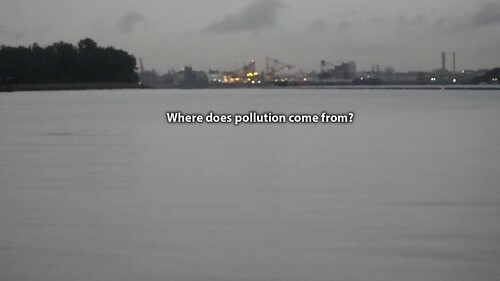 This shore was impacted by the 300-tonne oil spill in the East Johor Strait seven months ago. 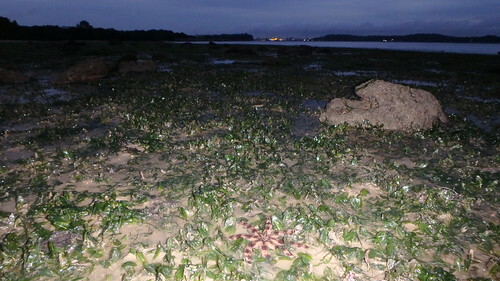 I was relieved to see lush seagrasses with sea stars and other marine life. As well as several dugong feeding trails! 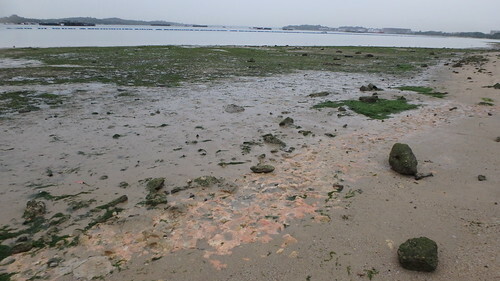 The oil spill started at Pasir Gudang in Johor, whose lights were visible at dawn, as shore birds foraged on the seagrasses of Pasir Ris. It was nice to see dugong feeding trails in the lush seagrass meadows here. 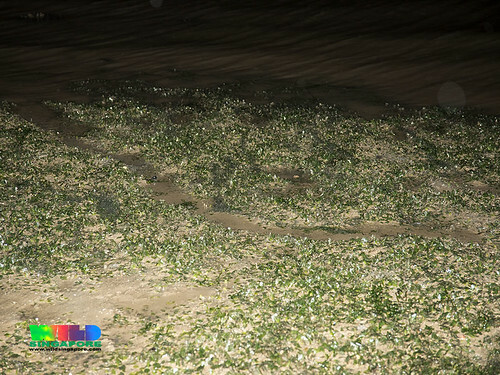 Dugong feeding trails are formed when dugongs chomp up seagrasses, leaving a shallow trail of about equal width. Spoon seagrasses are among their favourites and these furrows were seen in meadows of Spoon seagrasses. The Spoon seagrass had large leaf blades and were nice and fresh and green. I did not see any that were bleaching. I also saw a few patches of Hairy spoon seagrass as we did on our last survey here in Oct 2015. It was nice to see one small Eight armed sea star. 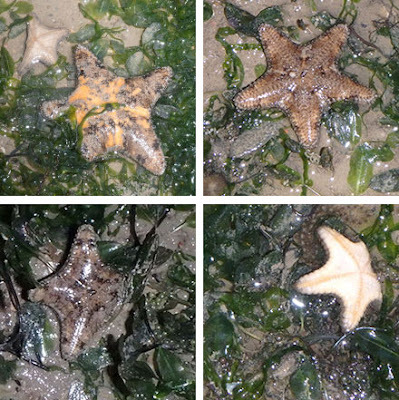 But I'm surprised to see only one Biscuit sea star. Most of the sea stars I saw were tiny to small Cake sea stars. I didn't come across any Sand stars. I saw a few Black sea urchins on the rocks. I saw a few Ball sea cucumbers and one small Garlic bread sea cucumber. 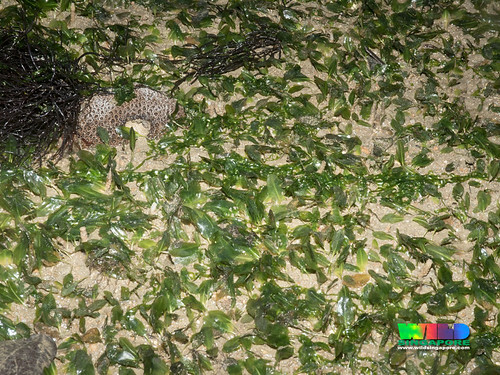 We also came across one large Slender seagrass octopus. There were also a few snapping shrimps and many swimming crabs and Stone crabs. On the high shore there were signs of Sand bubbler crabs and Ghost crabs. The ground here is very soft and silty. So it's not surprising to see many sea pens. 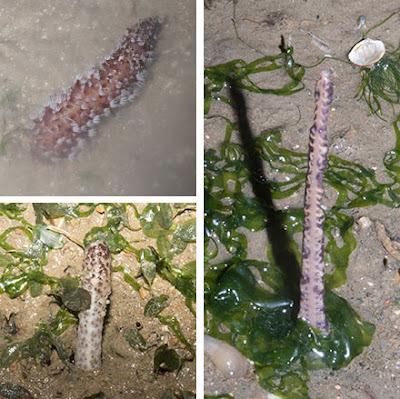 I saw many Flowery sea pens, many Sea pencils and several Slender sea pens. There were a few Cerianthids, and one had a lot of little black Phoronid worms. Although I saw several Haddon's anemones, I did not many other kinds of anemones. Zebra coral encrusted many of the rocks on the shore. Most were nice and brown, although a few patches were rather pale. But I didn't see any sponges on the rocks, similar to our last survey here in Oct 2015. 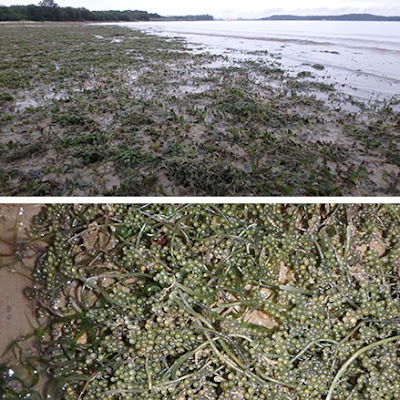 As usual, there were clumps of seaweed on the shore, mostly Gracilaria and Ulva. I was surprised to see many clumps of Round sea grape seaweeds. I don't usually see large amounts of this seaweed on our Northern shore. This is my first sighting at Pasir Ris. A sign of a changing shore? 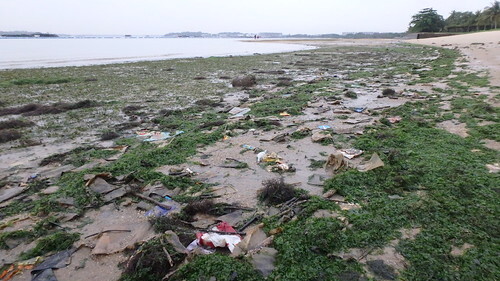 I saw some scum on the waterline and a look around suggests that this came down the drain that flows out onto the shore. 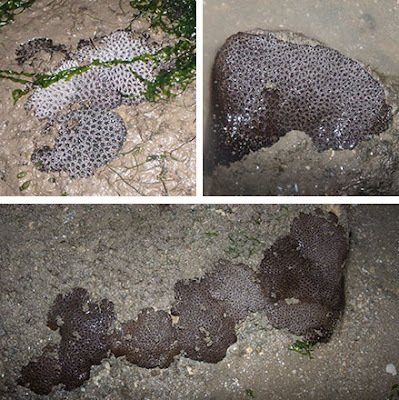 I saw similar scum on another stretch of Pasir Ris that I surveyed in May 2017. There is still a lot of trash on the mid water mark even within the Park boundaries. I did not have the energy to do the area outside the Park. In some part of the shore, clay is beginning to show up. A sign of erosion? I met two fishermen fishing on a sand bar. I asked and one of them said the fishing was no good. Our last survey here was in Oct 2015 but it was done during an evening tide. 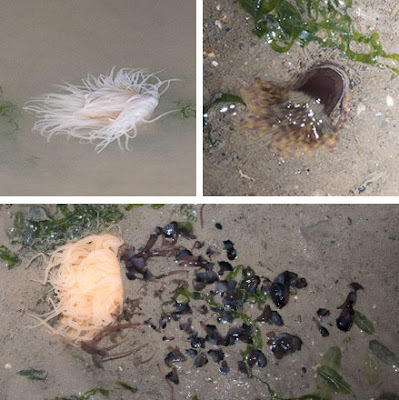 The last morning low tide survey was 3 years ago in May 2014 when I saw much more marine life. 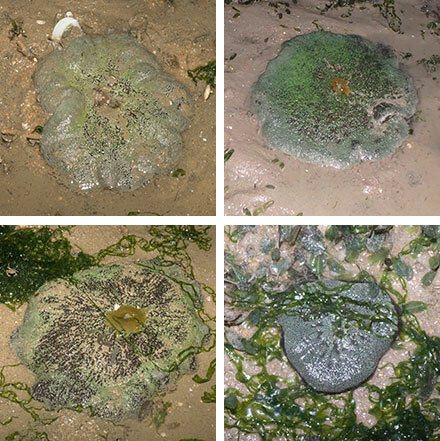 In May 2017, we surveyed another part of Pasir Ris further away from Pasir Gudang, where we saw many more anemones. Teo Say Chong on facebook.